This week, watch the revamped Teen Titans Go! 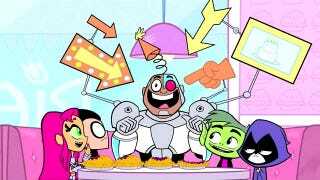 This week in the world of cartoons, the newest incarnation of Teen Titans Go! kicks off, the cast of Adventure Time (well...most of the cast) enjoys a potluck, and we take a gander at a great retro-toon from 1986. Ultimate Spider-Man & Transformers: Prime are off this week, with Transformers: Prime on a bizarre hiatus until mid-May. As always - minor spoilers ahead! Teenage Mutant Ninja Turtles – "Karai's Vendetta"
This week the Ninja Turtles are going after Kraang's base, a headquarters that lies deep in Davey Jones' locker. Karai and the Foot Clan kidnap April along the way, with April showing she is more than able to fend for herself. Transformers – "Five Faces of Darkness, Part One"
Since Transformers: Prime is off for a few weeks, here's a look at one of my favorite G1 episodes. This 1986 episode starts off with Autobot festivities surrounding the 2005 Galactic Olympics (a vary different 2005, albeit 2005). I always loved this particular scene, as it shows what our favorite 'bots do during their downtime. Adventure Time – "Princess Potluck"
I'll do anything I can to get out of a potluck dinner (lukewarm casseroles might as well be bacterial WMDs), but the Ice King apparently loves these culinary free-for-alls. After hearing of a potluck but not failing to receive an invitation, the Ice King does everything in his power to make the other denizens of the kingdom jealous. Regular Show – "K.I.L.I.T. Radio"
When a man loves a woman...let's kill this Michael Bolton segue now. Enamored with Stella, Muscle Man pens a song for his lady with the hope of getting it played on the local radio station, K.I.L.I.T. One problem - neither Mordecai, Rigby, or Muscle Man know anyone working at the station, leading the trio to use force to make Muscle Man a little more lucky in love. Teen Titans Go! – "Legendary Sandwich"
The first episode of the new TTGo! series is here! The episode centers on the journey for the components of a rather obscure sandwich, with Raven dispatching each of the Titans so she can get some alone time. Check out the nice My Little Pony: Friendship is Magic nod in this clip. Teen Titans Go! – "Pie Bros"
We get two episodes of the new DC series this week, with the second episode celebrating Cyborg's birthday. Beast Boy wants to get his best bud an amazing gift, so he gets a part time job. Top image courtesy of DC & Cartoon Network. Adventure Time and Regular Show air Monday nights on Cartoon Network. TMNT airs Friday Nights on Nickelodeon. Teen Titans Go! airs Tuesday nights and Saturdays on Cartoon Network.